My children made these disappear so fast I was stunned. Even my youngest, who doesn’t like spicy foods. These pork chops are very tender and very spicy. They are also absolutely delicious. In a medium sized saucepan over medium heat, combine all of the ingredients except the pork. 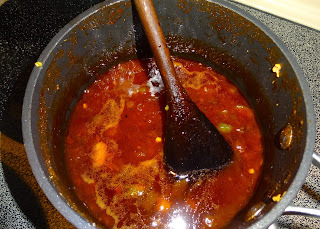 Let the sauce gently boil for about thirty minutes stirring occasionally. You may need to reduce the heat to medium low. When the mixture has become the consistency of barbecue sauce remove it from the heat. Place the pork chops in a medium sized baking dish and pour the sauce over the top. Bake the pork chops in the oven for one hour at three hundred and fifty degrees. Allow to cool for ten minutes before serving. Top with sour cream and enjoy!